Then she made...: Trendy? Trending? Trends? Giraffe! So, sometimes do certain words just feel weird coming out of your mouth? Every once in a while that will happen to me. Like the word: Trend. I'm not sure why, but I find it strange and it seems to be popping up everywhere lately. Characters on the shows I've been watching lately are using that word in their scripts. I've heard it say, "it's trending world wide." What? Trending? What is "trending"? As for myself, I've never really thought of myself as trendy. In fact, I'm not. I usually steer clear of trends. I'm quirky, not trendy. Plus, I fear trends a little because they go out of style fast. I usually play it safe, stick with the classics, and live happily ever after. That was until I got my Mother's day gift. Remember my box? My box of pure happiness? I mentioned it before but I failed to tell you what was in it. Trendy happiness was in it. I actually did a happy dance after the UPS man left the package at my door and I was absolutely giddy opening it up. Can you see it in there? It's hiding under the paper. I mean - come on - wouldn't you be if you knew this was yours? I hugged it. My family thought I was weird. They were right. Yes, I'm going against everything I thought I was and I'm now following a trend. I own an animal head. Boy! That feels good to get that out. So, why was I so happy about this? Well, it all started summer of 2011 I went on a trip and visited family in Utah. While there I roamed through the local Anthropologie store - sadly we don't have one in Fort Collins. 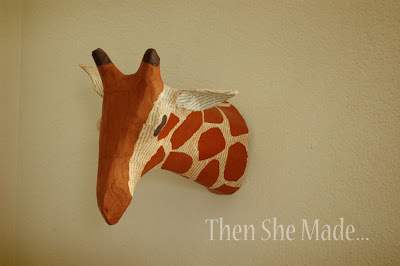 Hanging on the wall was this giraffe and I was completely smitten. I almost bought it on a whim but resisted. However, I've been thinking about this thing ever since. I pinned it. I'd stalk it on the Anthropologie website and I'd talk about it. The mister, being the awesome man that he is, decided to buy it for me. I'm not sure if he did it out of niceness or just to get me to shut up. Maybe both. Regardless of the reason, it was a well received Mother's day gift. 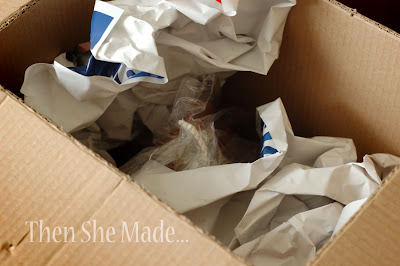 Savannah Story - Anthropologie - this is where mine came from. I think the Rhino is pretty awesome too. West Elm Animal Sculptures - These were trending over at Eighteen25 this week. Check out the hippo. And, last but not least - I'm SO totally love with this. 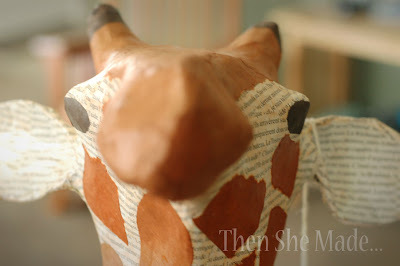 Over at Little Blue Boo there's and AMAZING tutorial on how to make your very own animal head. My daughter has a joke thing going on with one of her friends about Unicorns and I tell you what, this just might be on our summer to-do list. It's just that awesome! I reread your post and I think the head is very quirky! Not sure I would consider that to be trendy, so you are safe....you are still quirky in my book.